The images of food you submit to this contest do not have to be an exact replica of what you saw on our feed. For instance, got inspired to braise something after you saw a post on our feed? Made overnight oats for the first time? Added pistachios to pancakes? Made a pear and blue cheese pizza? Sprinkled sumac on top of your eggs? Dried flowers for tea? Added vermouth to your homemade miso soup? These are just a few examples of how Julie Resnick, feedfeed founder, has been inspired. 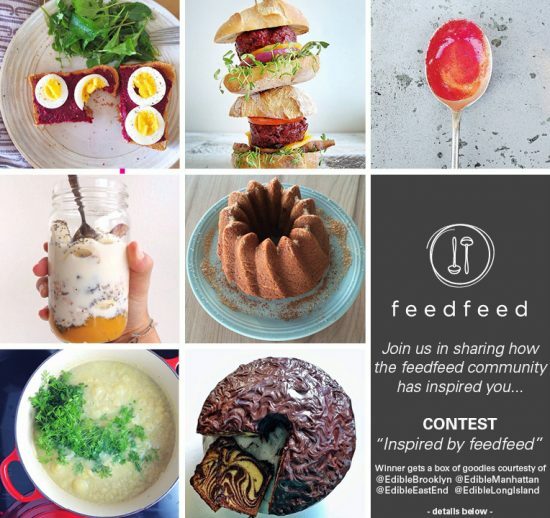 Feedfeed will re-gram their favorites throughout the contest, and the first place winner will receive a box filled with local and seasonal treats from New York sponsored by Edible. (We will ship internationally!) Contest begins today and runs until Saturday May 3 at 11:59 pm EST. Winner will be announced Monday, May 5. Please make sure to add “Inspired by @thefeedfeed and #feedfeed” in your original caption of your post to make sure we see your submission. If you want to include an image previously posted on your feed, please repost so the comments are in the original caption.